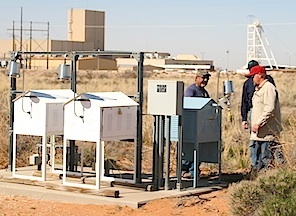 WIPP Radiation Release: "We never, ever thought this kind of an event would occur"
Follow NWNM's Watchblog for updates on the radiological contamination release at the Waste Isolation Pilot Plant (WIPP). From The WIPP Problem, And What It Means For Defense Nuclear Waste Disposal, by Robert Alvarez, senior scholar at the Institute for Policy Studies. "In 1979, Congress authorized the design and construction of WIPP, planned to be a repository for a class of waste known as transuranic (TRU)- that is, radioactive elements heavier than uranium on the periodic chart, including plutonium, americium, curium and neptunium- and generated by the US defense effort after 1970. A bedded salt formation was chosen as the site of the project because of its presumed long-term stability and self-sealing properties. After several long-running legal challenges, Congress authorized the opening of WIPP in 1992 and set a cap of 175,000 cubic meters of waste to be disposed. Seven years later, WIPP began to receive wastes. The end of the Cold War and the downsizing of the US nuclear weapons complex expanded WIPP's mission to include excess plutonium. Instead of just contaminated rags, clothing and equipment, in 1998 the Energy Department decided to dispose of plutonium, originally part of the US strategic stockpile, from the now-closed Rocky Flats site. Some 3.5 tons, or more than 70 percent of the plutonium stored in WIPP, was originally meant to be used in nuclear weapons. WIPP now holds more than 171,000 waste containers containing approximately 4.9 metric tons of plutonium." See more: The WIPP Problem, And What It Means For Defense Nuclear Waste Disposal, by Robert Alvarez, senior scholar at the Institute for Policy Studies. Please help us in our work to rid the world of the dangers of nuclear weapons by making a donation! The "dilute and dispose" process would package and dispose of the plutonium as waste rather than processing it for use as nuclear reactor fuel. The disposal processes consists of mixing plutonium oxide with "stardust," a secret inert material, into small containers that are then placed in drums for geologic disposal. MOX- a good idea gone bad. The Albuquerque Journal reports: "At Los Alamos and Sandia National Laboratories, the breakdown in the bilateral agreement may deal a decisive blow to already deteriorated relationships between scientists at New Mexico's national laboratories and their Russian counterparts, who had been working together to iron out the technical aspects of plutonium disposition under the deal, according to Don Hancock with the Southwest Research and Information Center in Albuquerque." What about Deep Borehole? Not yet. The first step, a deep borehole test drill, was rejected by communities in both North and South Dakota. (ref) Science notes local "fears that the project would open the county up to a future as a disposal site, or that drilling could go awry and pollute aquifers..."
DOE is in a rush to re-open WIPP even though the facility cannot meet the previous operational and safety standards, let alone more stringent requirements that are necessary to prevent future accidents. The WIPP underground remains contaminated, so operations have to be greatly changed, including workers being dressed in 'ebola suits'. Ventilation will not be restored to the pre-2014 levels until 2021 or later - the new system is not designed and how much it will cost is unknown. Contact New Mexico Senators Udall and Heinrich (and other elected officials) and ask them to stop the rush to re-open an unsafe WIPP. Ask them to require DOE to drop the expansion proposals and commit that WIPP will not be considered for high-level waste. Ask them to have Congress reiterate that the WIPP law is not being changed to allow those expansions. Here is a sample letter you can use or modify for use as you wish: PDF. LANS failed to get the award term, a condition DOE had set for continuation of the LANL management contract beyond 2017. On Thursday, April 23, the Department of Energy will host a Town Hall meeting in Los Alamos to discuss the Accident Investigation Board (AIB) findings from the Feb. 14, 2014, drum breach that shut the Waste Isolation Pilot Plant (WIPP) down. Members of the AIB, will be on-hand to present the findings and answer questions. The meeting will begin at 5:30 p.m. April 23 at Fuller Lodge, 2123 Central Ave, Los Alamos. The meeting will be broadcast live on radio stations KRSN 1490 AM and FM 107.1. It will also be audio-streamed live on the KRSN website. A video of the meeting will be posted to YouTube Friday titled 'Los Alamos AIB Town Hall'. 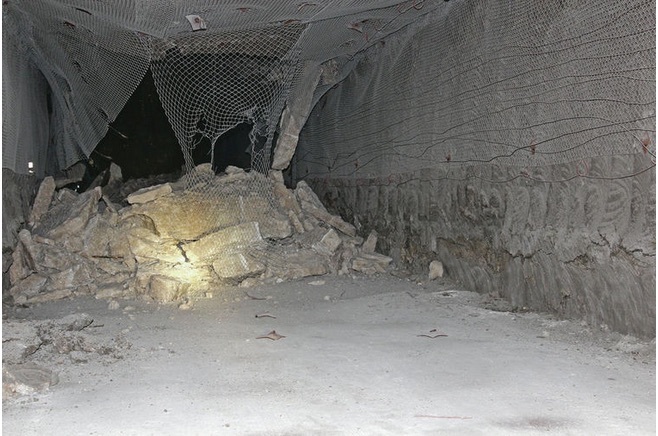 DOE's investigation of the February 2014 radiological release event at WIPP found a breached drum within Room 7 of Panel 7 of the underground facility. This drum contains nitrate salt-bearing transuranic TRU waste that originated from Los Alamos National Laboratory. The Los Alamos contractor and other national laboratories experimented and modeled to discern why this drum caused the release. They have yet to find the exact cause. 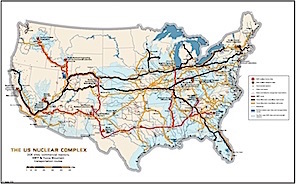 DOE also transported legacy transuranic waste from the Idaho National Laboratory, Savannah River Site, and the Oak Ridge National Laboratory to WIPP. The wastes remaining at these sites include some of the more challenging waste forms. The suspension of waste receipts at WIPP led the various storage and generator sites to find temporary storage (both onsite and offsite) for wastes that have been processed and characterized for shipment to WIPP. On December 6, 2014, Governor Susana Martinez hand-delivered to Department of Energy Secretary Ernest Moniz two Compliance Orders regarding violations of the WIPP and LANL permits related to the February 2014 events at WIPP. The Orders proposed fines of $17,746,250 for WIPP and $36,604,649 for LANL. DOE and its contractors have not agreed to pay any of the fines. If they cannot reach a settlement, hearings would be held, starting on July 27 regarding the WIPP fines, and September 21 regarding the LANL fines. There also are continuing permit violations at both WIPP and LANL, so additional fines are possible. - "Managers at LANL were not receptive to bad news and would retaliate in response to reported issues." - "Management didn't listen when workers at the waste processing facility reported witnessing 'foaming and an orange or yellow colored smoke' coming from drums.'" New Mexico's congressional delegation said in a joint statement "a series of critical failures of leadership at every level led to the very serious accident and release that put numerous New Mexicans at risk, shuttered WIPP for over a year and (has) already cost taxpayers tens of millions of dollars. This report makes clear that the DOE and its contractors failed to keep faith with the people of New Mexico." 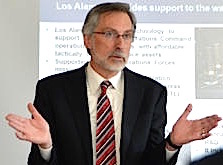 LANL director Charles McMillan wrote in a letter to staff that "the report points out serious deficiencies in our processes and procedures... We now know from the investigations that if LANL had followed certain basic steps, this event would not have happened. Also, if we had complied with our hazardous waste permit, we would have avoided the serious legal and credibility issues we now face... Quite simply, we failed to execute sufficient regulatory and technical reviews in our management of the legacy (transuranic waste) nitrate-salt waste stream." Director McMillan, whose annual compensation exceeds $1.5 million, outlined LANL's long list of changes and improvements that have been made. "I believe we are turning a corner on this difficult time for the Lab." One wonders if LANL will be turning that corner together with the current management. "A shocking account of foul play, theft and abuse at our nation's premier nuclear R&D installation, uncovering a retaliatory culture where those who dare to question pay with their careers and, potentially, their lives. 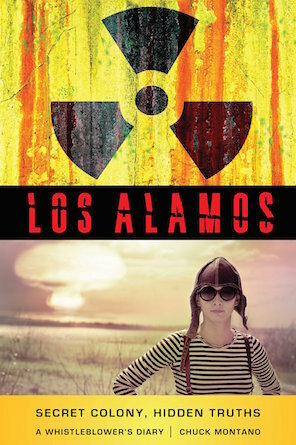 Los Alamos: A Whistleblower's Diary, by Chuck Montano. Release date April 28, 2015. Pre-order your copy from Amazon. Chuck Montano serves on Nuclear Watch New Mexico's Steering Committee. "In the summer of 2012, Gov. Susana Martinez visited the hilltop facilities of Los Alamos National Laboratory to commemorate a milestone. The lab, under an agreement with the state, had just shipped its 1,000th truckload of Cold War-era nuclear waste from the grounds of Los Alamos to a salt cavern deep under the Southern New Mexico desert. "The achievement meant the lab was well on its way to meeting a June 30, 2014, deadline imposed by Martinez to remove radioactive gloves, machinery and other equipment left over from decades of nuclear weapons research. 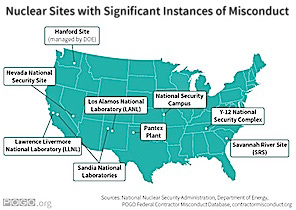 "For Los Alamos National Security LLC, the private consortium that operates the lab, the stakes were high. Meeting the deadline would help it secure an extension of its $2.2 billion annual contract from the U.S. Department of Energy. "But the following summer, workers packaging the waste came across a batch that was extraordinarily acidic, making it unsafe for shipping. The lab's guidelines called for work to shut down while the batch underwent a rigid set of reviews to determine how to treat it, a time-consuming process that jeopardized the lab's goal of meeting the deadline, and securing an extension on its $2.2 billion annual contract from the DoE. "Instead, the lab and its various contractors took shortcuts in treating the acidic nuclear waste, adding neutralizer and a wheat-based organic kitty litter to absorb excess liquid. The combination turned the waste into a potential bomb that one lab chemist later characterized as akin to plastic explosives, according to a six-month investigation by The New Mexican. "The lab then shipped a 55-gallon drum of the volatile material 330 miles to the Waste Isolation Pilot Plant, the nation's only underground repository for nuclear waste, southeast of Carlsbad. Documents accompanying the drum, which were supposed to include a detailed description of its contents, were deeply flawed. They made no mention of the acidity or the neutralizer, and they mischaracterized the kitty litter as a clay-based material not the more combustible organic variety that most chemists would have recognized as hazardous if mixed with waste laden with nitrate salts, according to interviews and a review of thousands of pages of documents and internal emails obtained through a Freedom of Information Act request..."
Get all the details: "LANL officials downplayed waste's dangers even after leak"
Oct 1. It seems sloppiness and failures by Energy Solutions*, the private contractor charged with mixing and packaging waste at LANL, along with others by 'Nuclear Waste Partnership', operators of WIPP, will close or cripple the $19 billion installation for 5 years and cost the taxpayer $500 million. And that's the DOE estimate. "A blistering new federal report says Los Alamos National Laboratory failed to follow its own safety procedures and ignored internal reports warning against mixing potentially volatile chemicals in the handling and packaging of nuclear waste- a series of missteps that may have led directly to a radiation leak at the Waste Isolation Pilot Plant near Carlsbad. "The report, released Wednesday [Oct 1] by the Department of Energy's Office of Inspector General, paints a disturbing picture of safety and oversight weaknesses at one of the nation's premier nuclear weapons and research laboratories. Though the cause of the leak is still under investigation, the report is the most damning assessment yet of the lab's role in the Feb. 14 incident that exposed more than 20 workers at WIPP to low levels of radioactive contamination and shut down the nation's only underground repository for nuclear waste. 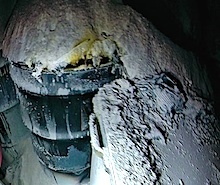 "Without knowing the cause of the leak, the extent of the contamination in the WIPP caverns or whether more breached drums may be lurking in the cavern, Hancock said the Energy Department's recovery plan could be premature. 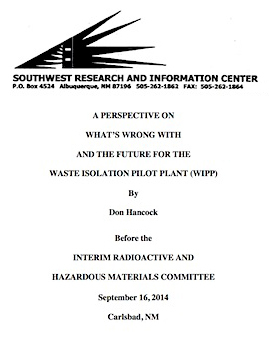 'Nowhere in the report does it say the fire and radiation leak that happened this year will never happen again', said Hancock, who favors an independent technical investigation and public study to develop a path forward at WIPP that is disconnected from the Energy Department and its contractor operating WIPP, Nuclear Waste Partnership. "'They're saying, 'Trust us with the safety standards. We'll define what's safe or not.' That's not acceptable,' he said. 'We don't trust them. They've shown themselves not to be trustworthy.' Hancock described the cost estimate outlined in the plan as 'dishonest' because it neglects to mention the more than $150 million in operating expenses at WIPP for the fiscal year ahead, when even the most optimistic estimates envision WIPP will remain mothballed. "Hancock said the Energy Department's goal of partially reopening WIPP within the next 18 months would be virtually impossible if the department were to follow standard regulatory protocol for the waste dump, which includes public comment on the proposed changes. "'It's not a recovery plan, it's a shut-out-the-public plan,' Hancock said. 'That's not going to happen. The public is not going to be shut out of this process. It's a nonstarter.'" *On July 2 it was announced that 115 employees of Energy Solutions had been fired. Presentation by Don Hancock of the Southwest Research and Information Center to the Interim Radioactive And Hazardous Materials Committee, September 16, 2014, Carlsbad, NM. "-The declining safety culture was caused, in part, by DOE and NWP not focusing on safety and the WIPP mission, but rather putting significant management attention, expertise, and money into promoting mission expansion..."
"Just five days after an underground truck fire closed the Waste Isolation Pilot Plant, the Energy Department awarded the contractor that operates the nuclear repository $1.9 million for 'excellent' performance during the past year. New Mexico Env. Dep't: "Imminent and Substantial Danger to Public Health"
In the May 15 pictures, the LANL container has a cracked lid and shows evidence of heat damage. "In its only publicized theory, DOE suggested earlier this month that untreated nitrate salts may have combined with 'cellulosic material' - in this case, a new organic cat litter used as an absorbent - to cause a reaction that may have released intense heat. The idea is that the organic, instead of inorganic, cat litter not only didn't do its job but may have precipitated a reaction, according to a former WIPP scientist. "Nitrates in different forms are used to process plutonium, a radioactive element of nuclear waste, and are present in waste coming not just from LANL but other sites as well. On February 5, 2014 a diesel powered salt-hauler vehicle caught fire in the underground forcing workers to evacuate and operations to cease. The cause of the fire has not yet been determined, however this event occurred in an area removed from where waste is handled and emplaced. Waste handling operations in the underground will cease while the event is investigated. On February 14, 2014 at 11:13 PM a continuous air monitoring (CAM) alarm in the underground indicated the detection of radiation above background trigger points. A second alarm followed immediately indicating detection of radiation at higher levels. This triggered a switch from exhausting air to the environment to first passing exhaust air (effluent) through a filtration system before exhausting to the environment. 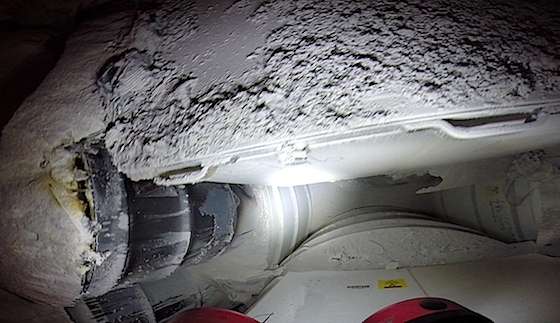 The Board concludes that a thorough and conservatively considered hazard analysis, coupled with a robust, tested and well maintained HEPA filter capable exhaust ventilation system could have prevented the unfiltered above ground release that occurred on February 14, 2014. The Board concluded that this accident was preventable. 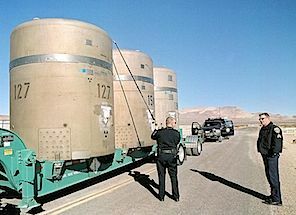 In light of the demise of the proposed Yucca Mountain, Nevada repository, some people are once again considering the WIPP for storage or disposal of commercial spent nuclear fuel (SNF) or defense high-level waste (HLW). At WIPP Environmental Impact Statement hearings in 1979, 1989, and 1997, at various congressional hearings, at numerous other public meetings, in public opinion polls, and at many statements until today, New Mexicans have overwhelmingly opposed spent nuclear fuel and high-level waste at WIPP. Numerous elected officials, including governors, attorneys general, senators, and representatives have also opposed spent nuclear fuel and high-level waste at WIPP. Public activities, political action, litigation, and other measures would be taken to stop spent nuclear fuel and high-level waste transportation, storage, or disposal. 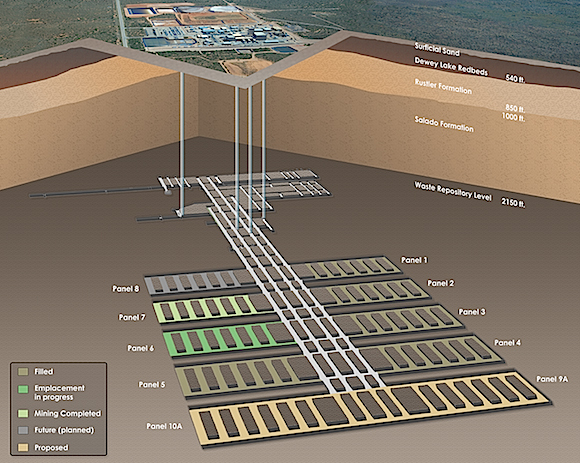 The Waste Isolation Pilot Plant is a deep geologic repository mined within a salt formation. 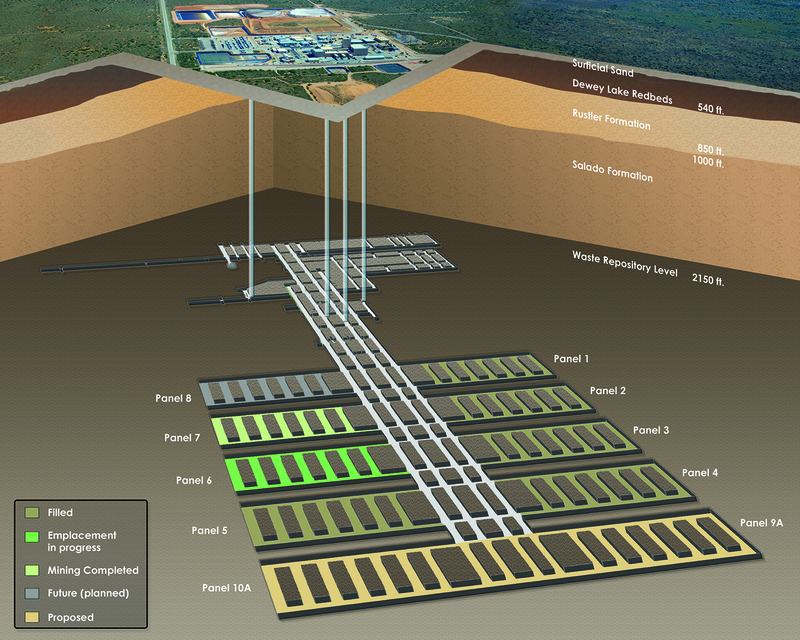 The WIPP repository is mined within a 2,000-foot-thick bedded-salt formation. The Underground (U/G) is 2,150 feet beneath the ground surface. Located in southeastern New Mexico near Carlsbad, WIPP was constructed to determine the efficacy of an U/G repository for disposal of transuranic (TRU) waste. Disposal operations began in 1999 and are scheduled to continue for 35 years. DOE was authorized by Public Law 96-164, Department of Energy National Nuclear Security and Military Applications of Nuclear Energy Authorization Act of 1980, to provide a research and development facility for demonstrating the safe, permanent disposal of TRU wastes from national defense activities and programs of the United States exempted from regulations by the U.S. Nuclear Regulatory Commission. The WIPP Land Withdrawal Act, Public Law 102-579, as amended by Public Law 104-201, authorized the disposal of 6.2 million cubic feet of defense TRU waste at the WIPP facility. 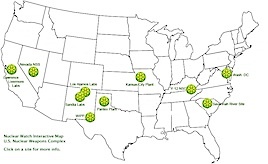 The WIPP facility operates in several regulatory regimes. DOE has authority over the general operation of the facility, including radiological operations prior to closure. The U.S. Environmental Protection Agency (EPA), through 40 Code of Federal Regulations (CFR) Parts 191 and 194, certifies the long-term radiological performance of the repository over a 10,000-year compliance period after closure of the facility. The State of New Mexico, through EPA delegation of the Resource Conservation and Recovery Act (RCRA), has issued a Hazardous Waste Facility Permit for the disposal of the hazardous waste component of the TRU waste. Additionally, the Mine Safety and Health Administration (MSHA) is required to perform four inspections per year of WIPP. TRU waste is categorized as "contact-handled" or "remote-handled" based on the amount of radiation dose measured at the surface of the waste container. Contact-handled waste has a radiation dose rate not greater than 200 millirem (mrem) per hour, while remote-handled waste can have a dose rate up to 1,000 rem per hour. About 96 percent of the waste to be disposed at WIPP is contact-handled. TRU waste is long-lived and has to be isolated to protect public health and the environment. Four shafts connect the U/G area with the surface. The Waste Shaft headframe and hoist are located within the Waste Handling Building and are used to transport TRU mixed waste, equipment, and materials to the repository. The Waste Hoist can also be used to transport personnel and materials. The Air Intake Shaft (AIS) and the Salt Handling Shaft provide ventilation to all areas of the U/G except for the Waste Shaft station. This area is ventilated by the Waste Shaft itself. The Salt Handling Shaft is also used to hoist mined salt to the surface and serves as the principal personnel transport shaft. The Exhaust Shaft serves as a common exhaust air duct for all areas of the U/G. The mixed oxide nuclear program, or MOX, is intended to convert plutonium from surplus nuclear weapons into commercial nuclear fuel. The costs of the program however have ballooned to $47.5 billion and the DOE is looking at disposal alternatives. That cost-effective alternative would be sending the surplus plutonium to WIPP. Unfortunately, WIPP is currently closed, recuperating from "a series of critical failures of leadership at every level" and the resulting fire and radioactive leak last year. See also accompanying fact sheet. WIPP woes due to wrong word? Note-taker wrote "an organic" instead of "inorganic"
New fines "would dwarf the already steep penalties the lab faces for its role in last year's radiation leak at the Waste Isolation Pilot Plant. 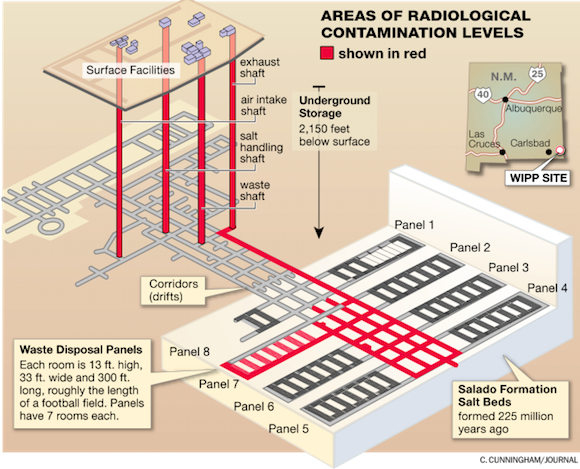 "...emails and documents obtained by The New Mexican describing safety assessments in May, June, and July raise questions about the stability of dozens of other nuclear waste drums that were in the same chamber as the drum that ruptured. More recent WIPP safety assessments have not been released, even to the union representing more than 300 WIPP workers. "'We don't know how safe WIPP is, even in the short run of the current underground activities', Don Hancock, an analyst with the Southwest Research and Information Center, which closely monitors WIPP, said after reviewing the documents." 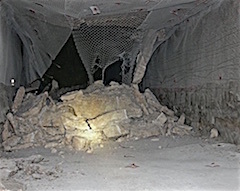 Update April 24: Loose and fallen roof bolts, cracks in walls found in contaminated zone. Ventilation system leaked radiation from Feb. 14 until March 6. Read a detailed analysis of the problems by Don Hancock, director, Southwest Information and Research Center. - Robert Alvarez, writing in the Bulletin of Atomic Scientists, 3/23/14.